With over 750 sports played across the world, this question invariably creates differences in opinion among the billions of sports fans globally. Depending on popularity and fan base, certain sports may be mainstream for a particular country or region and relatively unknown in others. Athletes of these mainstream sports are well known household names, enjoy lucrative sponsorship opportunities and have huge fan bases. However, social media has now opened up a plethora of opportunities in sports for athletes, teams and leagues to not just reach & engage with their intended audiences, but to grow the popularity of their sport — whether it’s mainstream or not. 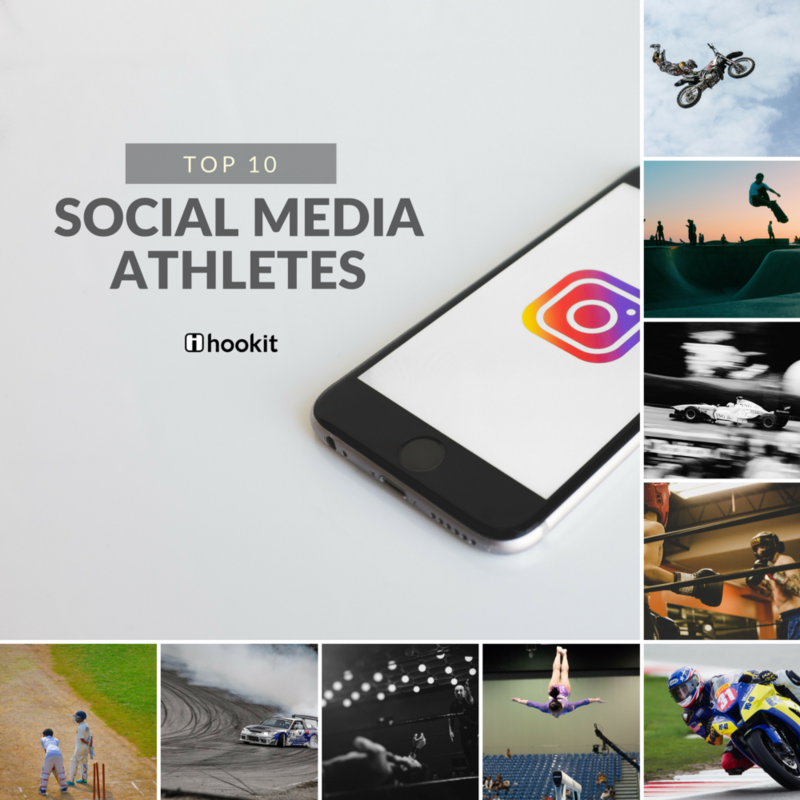 An analysis of the Top 100 athletes in Social Media in 2017 by Hookit yielded plenty of surprising results. A cursory glance at the results may show that the majority of athletes were from mainstream sports, particularly global football (aka soccer). Yet, athletes from niche/non-mainstream sports also had large follower bases and great engagement with their followers on social media in 2017. Listed below are the Top 10 breakout athletes in non-mainstream sports in the USA who had social media interactions equal to or more than their counterparts in mainstream sports. Methodology used: To find the non-mainstream sports in the USA, five major sports were excluded — the four major professional sports by revenue, i.e, American football, basketball, baseball, and ice hockey and the most popular sport globally — global football, aka soccer. Also, to keep the focus on athletes active in their respective fields, retired athletes were excluded. 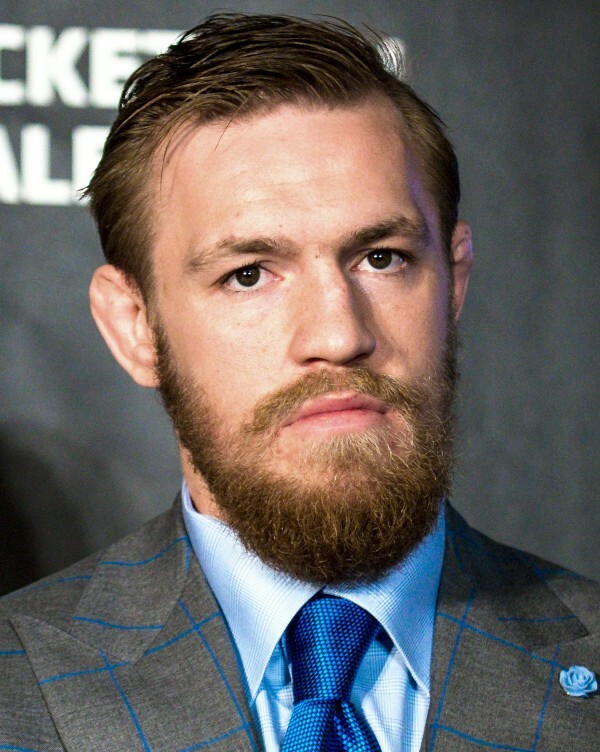 With 36M followers and 828M interactions across his social media channels, the Ultimate Fighting Championship (UFC) Lightweight champion had the 3rd most interactions among athletes in 2017. His Instagram post promoting HiSmile — a teeth whitening kit service garnered 15M views and was his most interacted post of 2017. 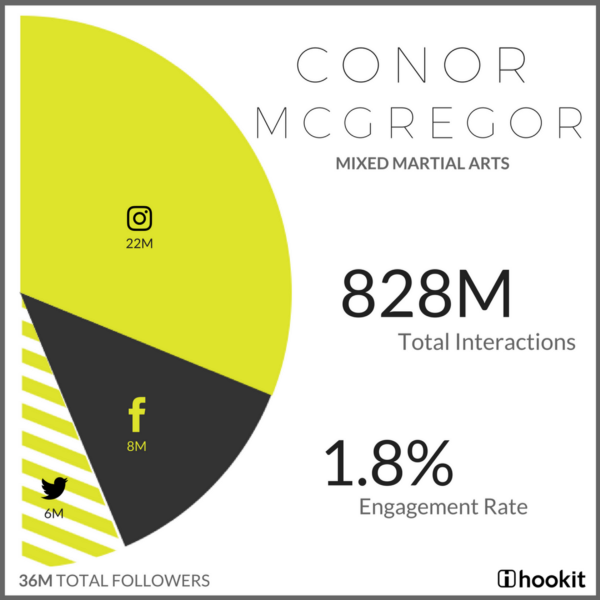 McGregor’s preferred social platform of choice was Instagram and his Instagram posts generated an engagement rate of 5.62% (compared to average Instagram engagement rate 1.5%). With 2.5B fans across Asia, Australia and UK, cricket is the second most popular sport in the world, despite being a non-mainstream sport in the USA. 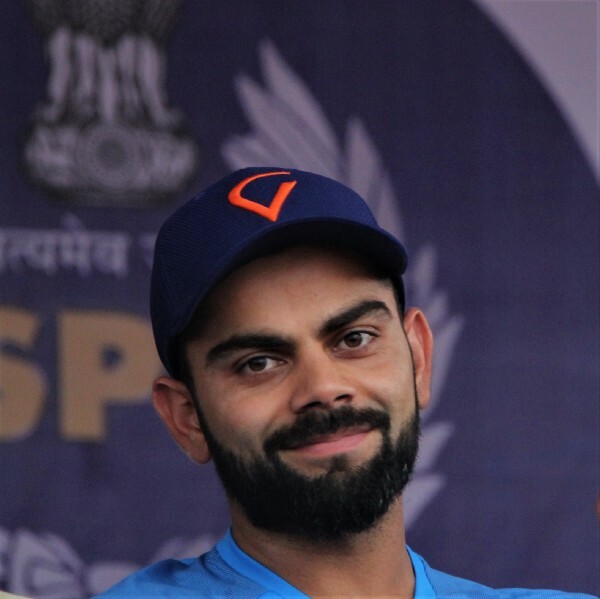 Virat Kohli, the captain of the Indian national cricket team is a hugely popular cricketer and has sponsorship deals with big name brands such as Puma, Tissot and Pepsi. With 77M followers and 399M interactions across his social channels he was one of the top athletes in social media interactions in 2017. His Instagram post was the 4th most interacted post in 2017 with 5M interactions. 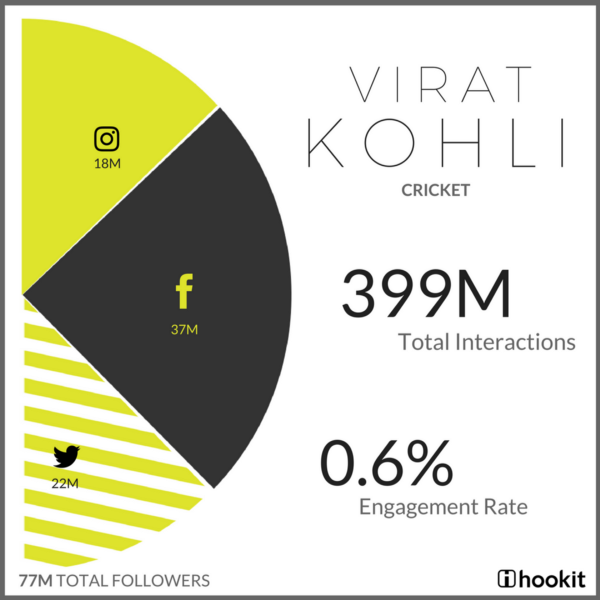 Kohli also has a high engagement rate of 7.85% on Instagram among the Top 100 athletes. (For comparison — the average Instagram engagement rate for influencers with over 1M followers is only 1.5%). Virat Kohli has 20M Instagram followers making him one of the most engaged and influential athletes on social media. 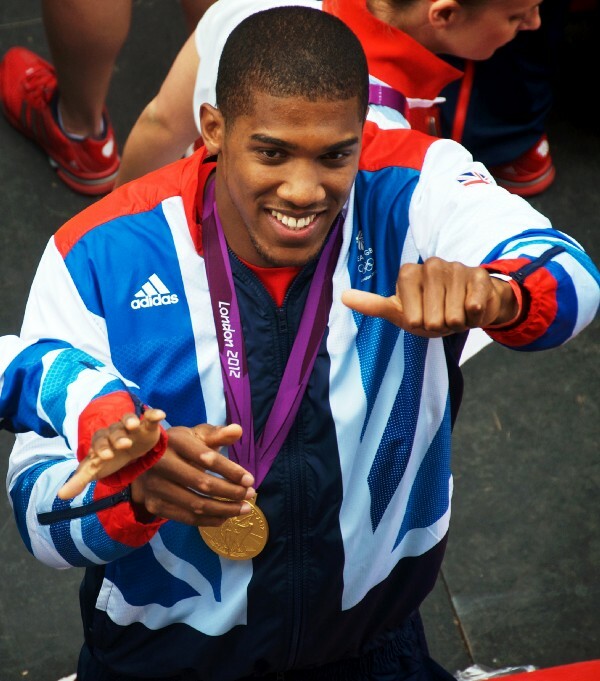 Olympic gold medalist and professional British boxer Anthony Joshua is a sport phenomenon in his home country Britain. He is currently the WBA and IBF heavyweight champion and has thousands of fans attending every fight. On social media, he has over 9M followers and had more than 180M interactions in 2017. 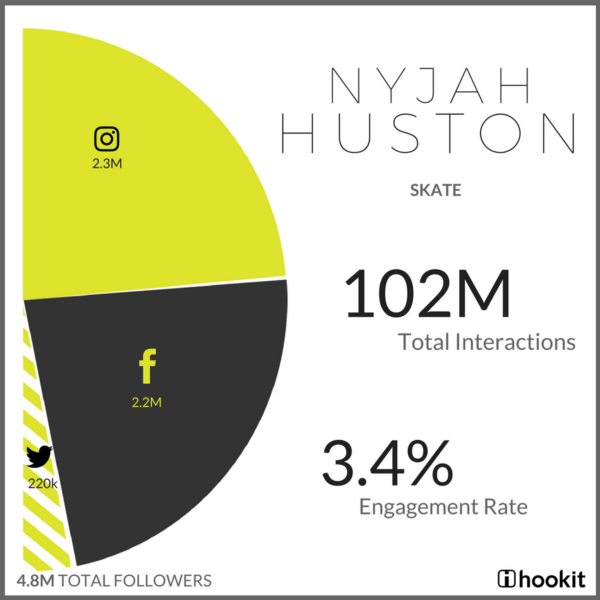 With an Instagram engagement rate of 9.9%, he has a highly engaged Instagram audience and an effective Instagram presence compared to other top athletes in social media. The “Head Hoonigan in charge” of Hoonigan Industries is a professional rally driver with the Hoonigan Racing Division, formerly known as the Monster World rally team. 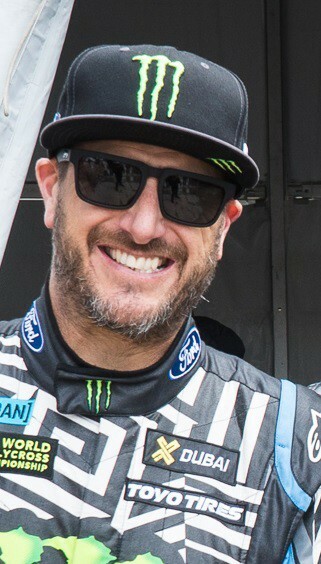 Ken Block has competed in events at the X Games and was the first American to campaign and win points at the World Rally Championship. His viral YouTube series titled “Gymkhana”, launched in 2008, is one of the most popular video series on YouTube with each video generating a minimum of 30M views. 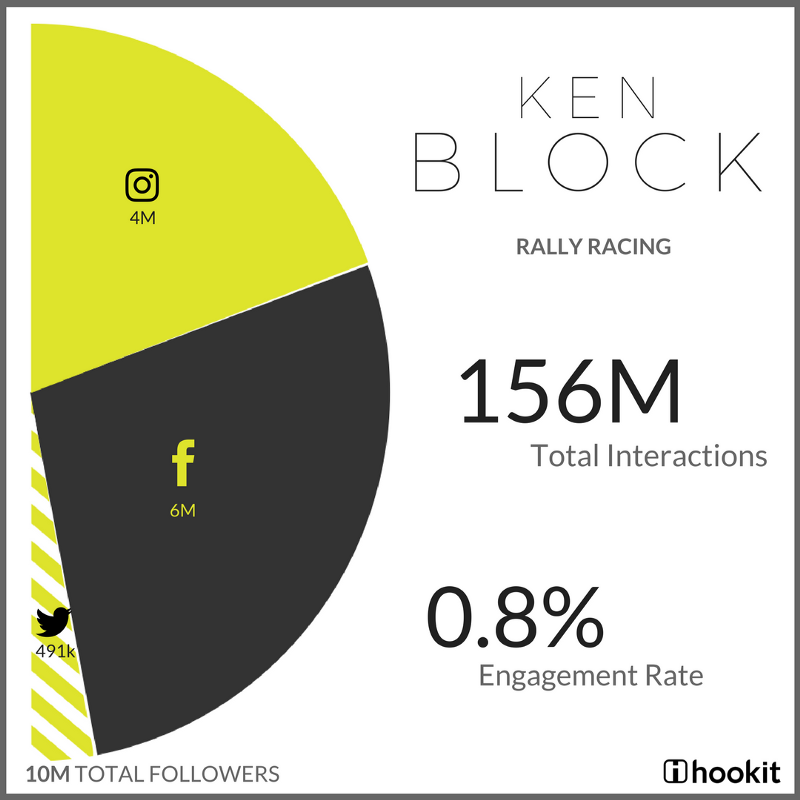 With 10M followers and 156M interactions across his social channels, Ken Block has high interactions across his social channels, beating out mainstream athletes such as Tom Brady. 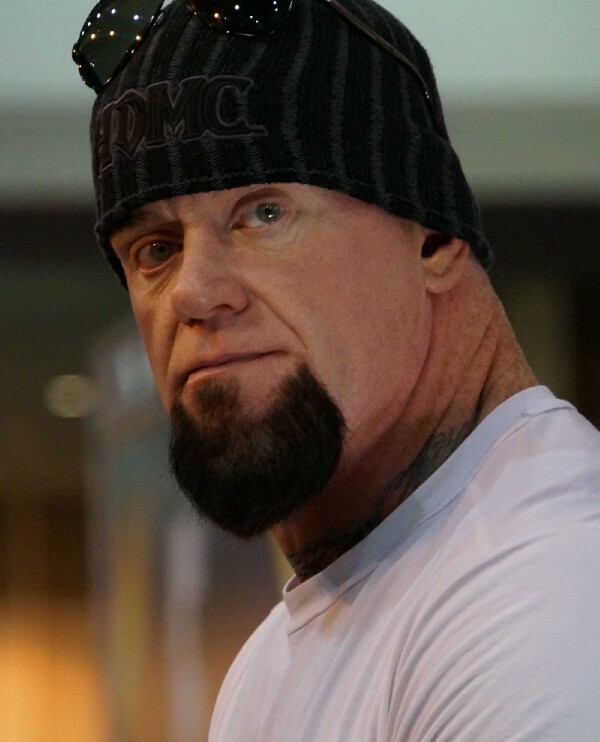 American wrestler The Undertaker, is best known for his 21 continuous victories at WWE’s Wrestlemania called “The Streak”. 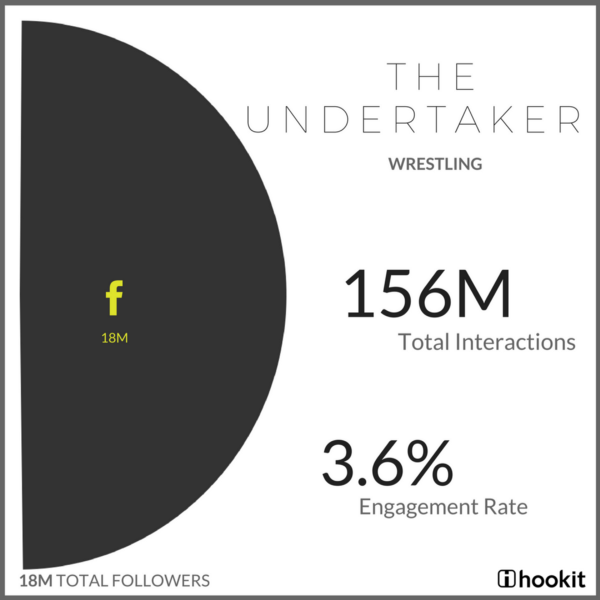 He is one of the most popular wrestlers in over 78 countries and has a social media audience of 18M. He has a social media presence only on Facebook but had over 156M social media interactions among his 18M followers making him one of the most engaged athletes on social media. 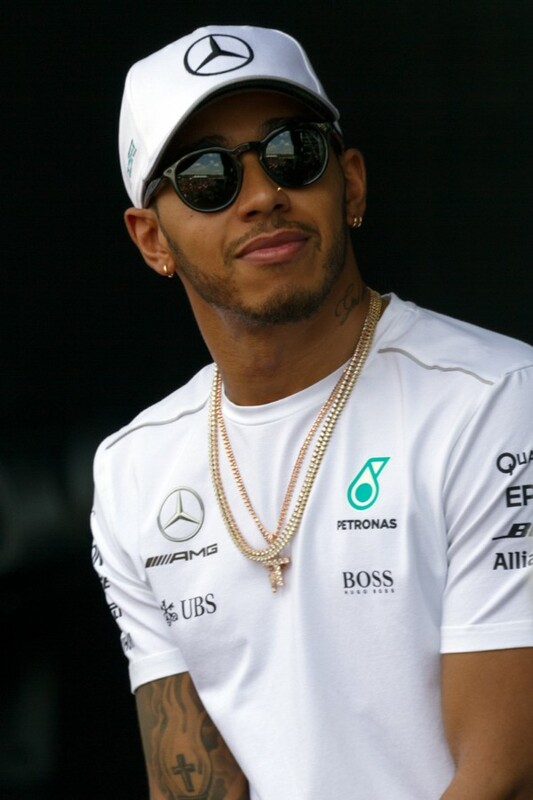 Lewis Hamilton is a popular British Formula 1 racing driver for Mercedes. He is a 4-time Formula 1 World champion and is considered one of the most successful British drivers in the sport. Instagram and Twitter were his platforms of choice in 2017, with Instagram driving 3.3% of his interactions on social media. 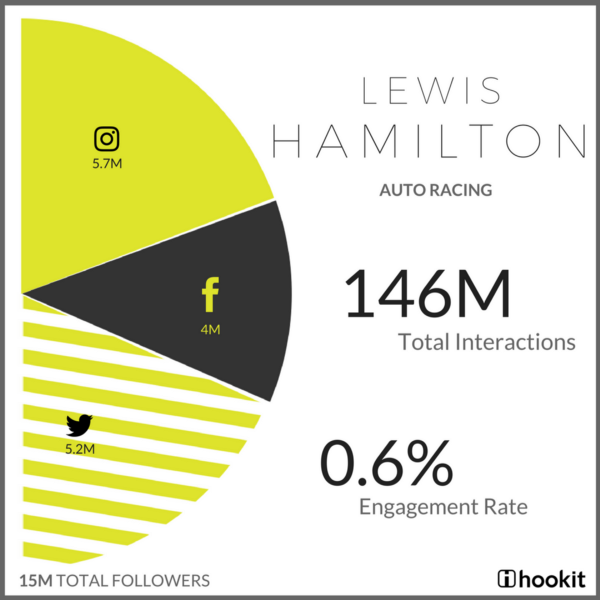 In 2017, Lewis Hamilton had 146M interactions and over 15M fans on social media. 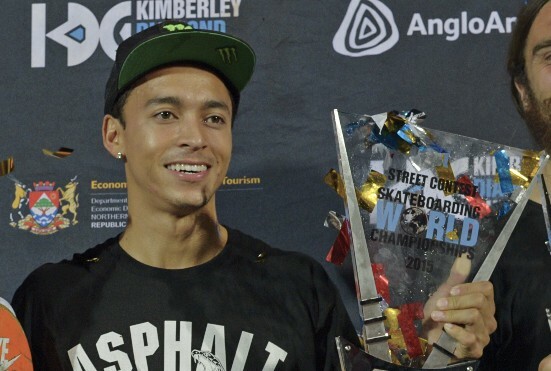 American professional skateboarder Nyjah Huston is a five-time Street League Skateboarding (SLS) champion and X Games gold medalist. With sponsorships from big name brands such as Monster Energy, Element skateboards and Mountain Dew and his own signature sneaker from Nike, he is one of the highest paid skateboarders in the world. In 2017, he had over 4.8M followers, 102M interactions across his social channels and an average engagement rate of 3.4%. 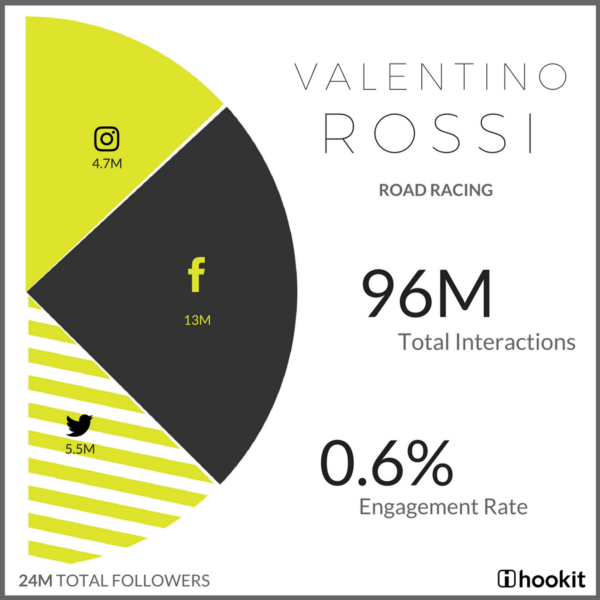 With 96M interactions on his social channels, the Italian Road Racer and multiple MotoGP World champion was also a winner on social media in 2017. 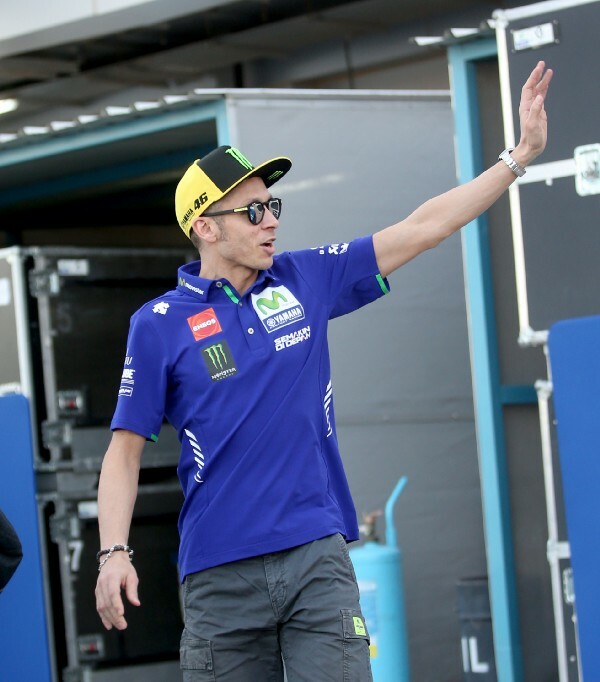 Widely considered to have the most dedicated fan base in MotoGP races, Rossi’s social media following is also substantial — he has more than 24M followers across his social media channels, which is 1.5 times more than his rival racers Marc Marquez and Jorge Lorenzo COMBINED. Simone Biles is a decorated American gymnast who has won a total of nineteen Olympic and world championship gold medals. 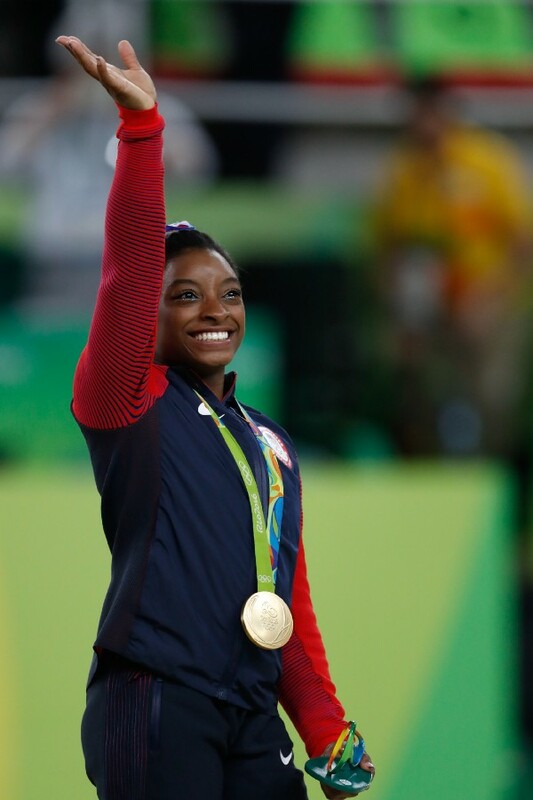 She holds the American record for most gold medals won in women’s gymnastics with her 4 gold medal wins at the Rio Olympics 2016. 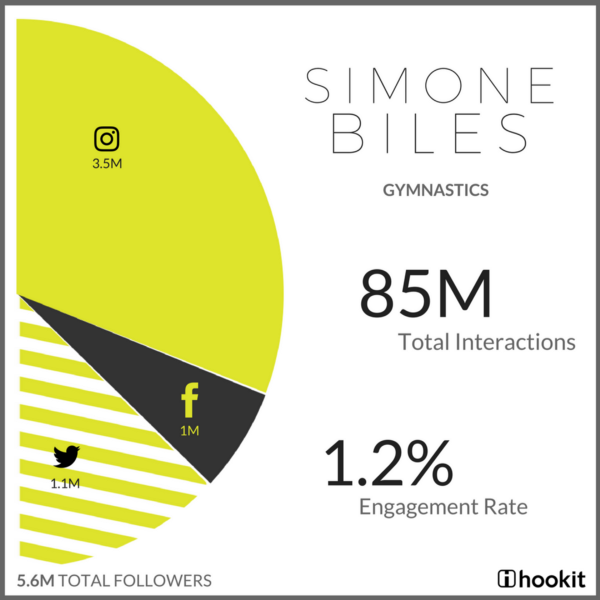 In 2017, Simone Biles had 85M interactions and 5.6M followers across her social channels — 63% of her total social followers were from Instagram. She is the only female athlete to hold a place in the Top 10 athletes of 2017 by social media interactions. 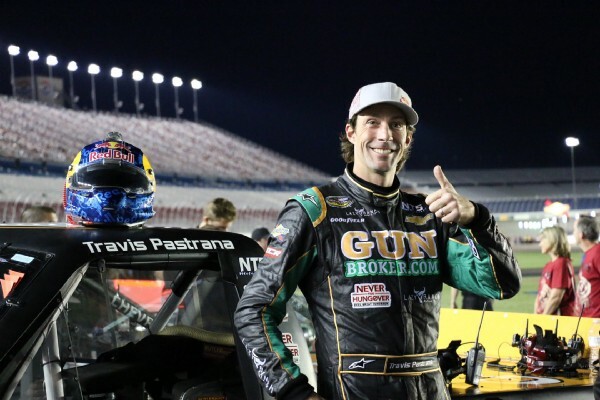 Widely considered the foremost extreme sportsman in the world, Travis Pastrana is an American motorsports champion who has won X Games gold medals in rally racing, supercross, motocross and freestyle motocross. He also founded NitroCircus, an “action sport collective” where Pastrana and other motorsports athletes perform big action sports tricks. 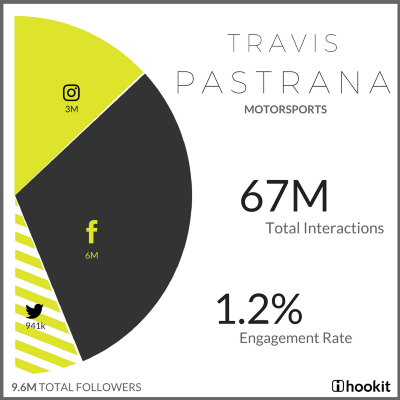 With 67M interactions, 9.6M followers and a high engagement rate of 1.2%, his success on the track and connection with his fans is also reflected on his social media interactions with his followers. Cristiano Ronaldo — Global Football When considering the top 10 athletes of 2017 in social media, it is unsurprising to find Cristiano Ronaldo as the top athlete on social media by interactions and followers. With 2.46B interactions, 308M followers and an earned media value of $935M, Ronaldo was without doubt the most valuable athlete on social media in 2017. LeBron James — Basketball The hugely popular basketball phenomenon on court, LeBron James also has a large following on social media — with 98M followers across his social channels. 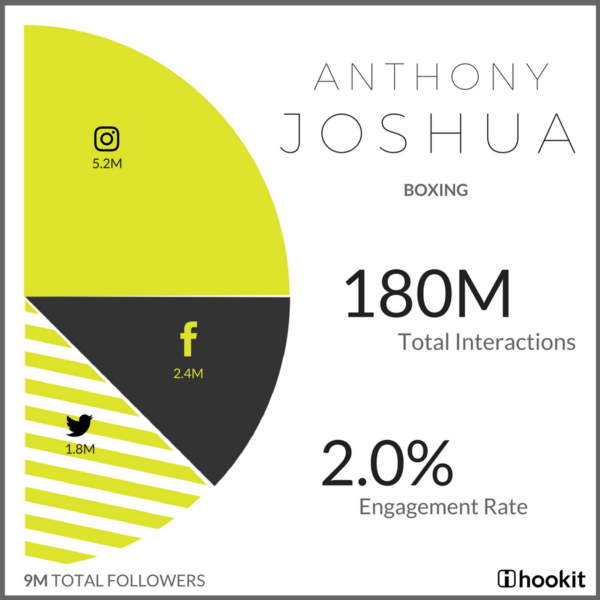 He was 10th among the top athletes with 266M interactions in 2017, and was one of the most engaged athletes on Instagram with 3.49% engagement rate. His top post of 2017 has over 9.9M interactions on Instagram. Roger Federer — Tennis The World №1 in Tennis has won 20 Grand Slam singles — the most by a male player in Tennis history and is extremely popular globally and on social media(30M social followers).With 159M interactions across his social channels, Federer was 24th among the top 100 athletes in 2017. Tom Brady — Football Tom Brady, the American Football quarterback and 4-time MVP has over 7.6M followers across his social media channels (he does not have a Twitter account). In 2017, he had 145M social media interactions placing him 31th among the top 100 athletes on social media. Retired athletes Ronaldinho Gaucho, David Beckham, Floyd Mayweather, Shaquille O’Neal and Dale Earnhardt Jr. were also among the top athletes by interactions. Their social media interactions place them among the Top 20 athletes. Among the Top 100 athletes by interactions, there were only 10 female athletes present. Chief among them were American Olympian Aly Raisman, Tennis grand slam champions Serena Williams & Maria Sharapova and Brazilian skateboarder Leticia Bufoni, who was named by Forbes as one of the most powerful women in international sports for 2018. Surprisingly, although baseball and ice hockey are mainstream sports in the US, retired athlete Alex Rodriguez was the only baseball player among the Top 100 athletes while players from ice hockey were absent from the list. Social media superstar or not? 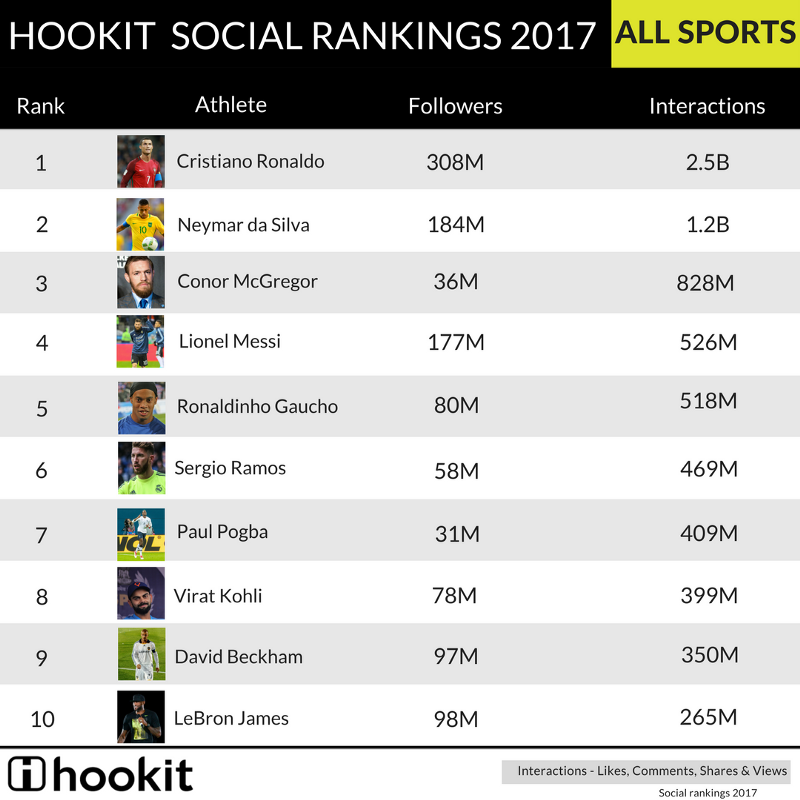 From Hookit’s analysis of the top athletes of social media in 2017, it is apparent that athletes who engaged consistently with their followers on social media have stayed on top — mainstream athlete or not. By embracing social media platforms, non-mainstream athletes are successfully promoting and engaging with their fans and intended audiences and increasing value for themselves and their sponsors. With evolving audience preferences for sport and the many ways in which sports is consumed, it has become essential for athletes and sponsors to track and gather insights from all sources. Did your favorite athlete make the list? Let us know in the comments below! Also, don’t forget to check if your favorite athlete is at top this month at HOOKIT RANKINGS! Did you know? Along with tracking 500,000 entities in the sports ecosystem across the four major social media channels — Twitter, Facebook, Instagram & YouTube, Hookit can also track OTT and Live stream platforms such as Vimeo, Ooyala, Brightcove, Snappy TV , Instagram stories and global social media platforms VK & Weibo. Hookit is the trusted standard in the marketplace that can provide comprehensive data insights by tracking the entire sports ecosystem across all social and digital channels. Learn MORE about how Hookit can help capture your sponsorship ROI.